Energy • Ernest Moniz calls on industry to minimize fallout from global warming. Idaho Falls • U.S. Energy Secretary Ernest Moniz championed the use of nuclear power and urged politicians and leaders in the energy industry to adapt and modernize energy production to help minimize the fallout from global warming. Moniz stopped to speak in Idaho Falls on Wednesday at the inaugural Intermountain Energy Summit as part of his weeklong tour throughout the West. Idaho&apos;s Republican congressmen Jim Risch, Mike Crapo and Mike Simpson also spoke during the conference. "The predictions of a world where we do nothing predict unhealthy outcomes for our forests," Moniz said. "Working hard on it means innovating energy technology. And I want to emphasize, the goal of energy is very simple, keep the costs down. As we have seen, that will make the policy-making easier." Repeating the Obama administration&apos;s "all of the above" energy strategy, Moniz said the United States isn&apos;t shunning coal or oil energy sources. Instead, officials are finding ways to reduce the fuels&apos; carbon emissions. 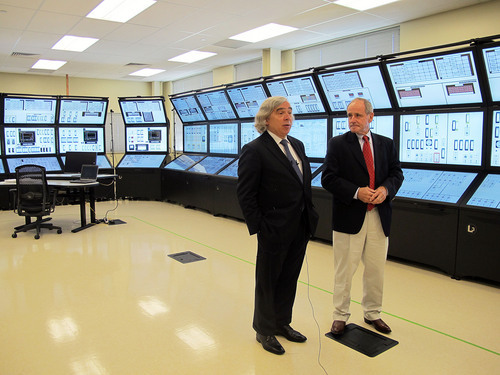 Moniz added that funding and improving the nation&apos;s 17 nuclear laboratories must also become a higher priority. Moniz said the U.S. Department of Energy would award $67 million for nuclear research and development to universities and labs across the country. Idaho will receive $3.7 million for six projects at the Idaho National Laboratory, Boise State University and Idaho State University. "I&apos;ll be honest, there used to be time where we thought of labs as places to execute tasks," he said. "And they really need to take more of a strategic role. We&apos;re having some success with that ... We want the labs to have a regional footprint." 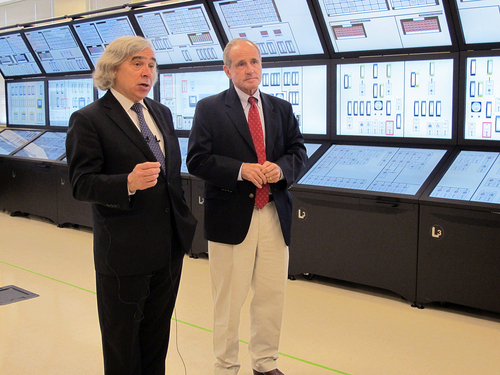 After his speech, Moniz and Risch visited the Idaho National Laboratory&apos;s newest research buildings. The modern lab provided a stark contrast to the nation&apos;s other aging nuclear infrastructure. 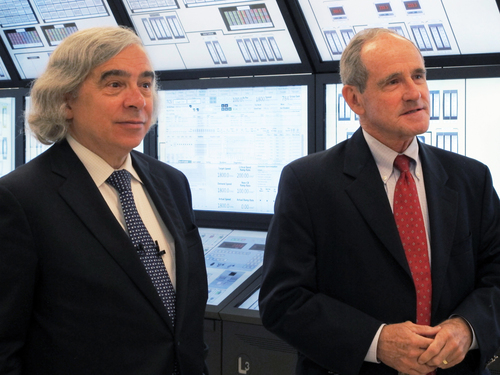 Both Moniz and Risch acknowledged the nation&apos;s nuclear labs were built decades ago with little improvement since, but they remained optimistic about the future growth of nuclear energy. Small modular reactors could possibly ease critics&apos; fears that nuclear energy costs too much to be efficient, Moniz said, but many of these are in the early stages of construction so there isn&apos;t much information on long-term costs. "The &apos;all of the above&apos; strategy, I think, is embraced by mostly everyone," Risch said. "Particularly here at the laboratory, they have already adjusted to all of the above. This is the lead nuclear facility in America right here in Idaho. As the future moves forward, there&apos;s going to be more and more of a drift to nuclear power. It has to happen." Risch added that it was his goal to continue to educate lawmakers in Washington, D.C., about Idaho&apos;s important role in nuclear energy. "Without abundant, cheap energy, people cannot get to the lifestyles they need to lead," he said. "We, Idaho, serve a critical role in that."